Well, I've caught THREE mice in a live trap. The first one died of shock? the second two, caught on successive nights ended up in a circular old fashioned fish bowl and quickly set up home. The first one was a wee little thing and was so excited when the medium sized companion arrived. They provided live television to one of my bostons who stood for circus-performing amounts of time on her tippy toes to catch a glimpse. With the warm weather, I facilitated their emigration to the Haskell Indian Nation College grounds where they raced into a hollow tree and peeking out, watched me distribute nuts and raisins and some torn up fabric for their new nest. Over the course of a resistant and arduous 15 or so hours on Monday and Tuesday, I completed my taxes. Talk about getting some perspective.... clearly, my business model is fatally flawed. My approach to being a successful artist has been to make what I want and hope that people purchase said creation. To a certain extent, this has been successful, the people who respond to my style and compositions really like them.... but have I ever costed out materials, tracked expenses, weighed time input to realistic minimum financial return? That would be the opposite of headlong, blinders firmly in place, directionless endeavors. It's amazing how much resistance I am experiencing towards standing back, taking a deep breath and taking stock of my options and where to put my energy now. Paintings and collections of Roger Shimomura at the Lawrence Arts Center from February 11 to March 12th. 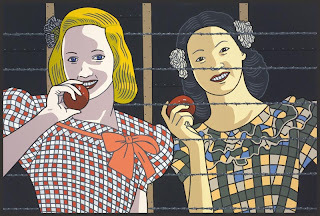 Make time to see this... Not only is his work stunning, but the subject matter - his early years at a Japanese-American relocation camp in Minidoka, Idaho - is truly rich and poignant. I have admired his work from afar and having lived in the culturally rich and historically aware PNW, been painfully conscious of the shameful actions of our government during WWII. Being able to see these huge paintings up close and to stroll through his extensive collection of artifacts and ephemera collected from the 10 different relocation camps is a humbling experience. Here is an excerpt from the brochure written by the Lawrence Art Center's Director, Susan Tate. There is a striking revelation in this exhibition that while the camps were not intended to foster creativity, somehow life and creative acts persisted. These are embodied in the works that Shimomura has collected. Students, scholars, collectors, artists and social activists will discover juxtapositions of destruction and creation, as well as a contemporary and historical study of xenophobia and society's response to it. I prefer to be focused on what is right in front of me, have difficulty formulating big picture plans, and tend to move from project to project, leaving a trail of clutter and crumbs behind me. If I ignore the mice, they will continue to nibble away at my artwork (yes...they actually ate part of a 3-d cardboard cathedral I made in the early 1990's) my art and sewing supplies, and cause my daughter to shriek and leap out of her chair with indescribably horror as they scamper across her breakfast. Basically, although I am a strong proponent of "live and let live" (I'd love to just co-habitate with the mousies), it is now time for Action. and that is Action with a capital "A". If I ignore the component details of an overarching plan for my business, I will go further into debt and not achieve financial satisfaction from finding a product(s) that sell and sustain the rest of my creative outpouring. I will be sending out a survey to all the peeps on the Valentine-Making Open house mailing list to get ideas and brainstorm future events. How can I sustain my self (home and family) as an artist? It's an age-old question without answers and then to boot, very few are actually successful, however, that shouldn't preclude me from being part of that small percentage... right? is there an even more flexible option? That is where explorations will be going in the next week or more. ps. the February Dress is about 1/3 finished! Late, yes, but surely worth the wait. I hope you are able to get a handle on your dilemma's so you can get some peace. Take care. This is a focused and well-thought out piece. I think you are on your way. xo. Business details seem to be the mice that nibble at the fun of creating. But they must be dealt with. I'm glad you went with the catch-and-release route. For the mice, not the business details, natch. did you know there was a movie "Klimt" with John Malkovich? It sounds like a must-netflix!